A man always has two reasons for the things he does -- a good one and the real one. — J.P. Morgan. I have frequently have found this statement to be true. US President at Inauguration (Wikipedia). 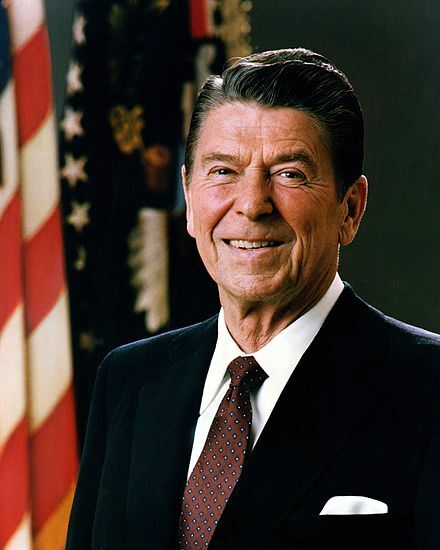 Ronald Reagan (Figure 1) was our oldest president at the time of inauguration – 69 years 349 days old. The 2016 US presidential election is giving us a choice of two candidates that will be relatively old at inauguration: Donald Trump (70 years, 220 days), and Hilary Clinton (69 years, 86 days). Since US presidents often serve 2 terms, it is conceivable they we may have a 77- to 78-year old president in 2024. This fact makes me curious as to what is the likelihood that a 70 year-old's natural life will be long enough for them to serve one or two terms. We can easily compute this probability using an actuarial life table. In this post, I will compute the probability that a 70-year old male or female will complete one or two 4-year terms. The basic math behind the life table is well covered in the Wikipedia, and I will refer you there for the details. I have included an actuarial life table in Appendix A. The actual calculations are easily performed using a filtered pivot table version of the life table, which I show in Figure 2. Figure 2: Calculation of the probability a 70 -year old will not live to be 74 or 78-years old. A 70-year old male has a 10% chance of dying by 74 and a 23% chance of dying by 78. A 70-year old female has a 7% chance of dying by 74 and a 17% chance of dying by 78. There is a ~23% chance that a 70-year old male president would not be able to complete 2 terms, which is about what I would have expected. There is ~17% chance that a 70-year old female president would not be able to complete 2 terms, which is higher than I would have expected. Appendix A: US Social Security Administration Life Table. Table 1 is the 2013 life table used by the Social Security Administration (SSA). The analysis in this post consists of filtered pivot table version of this date. Table 1: 2013 Actuarial Life Table from the SSA. This entry was posted in General Mathematics, History Through Spreadsheets. Bookmark the permalink.